Approaching the six year anniversary of the 95 percent blockage in my 38 year-old lower anterior descending artery, I’m still counting my blessings. Happy to be alive, that’s what I am. I snuggle longer, stress less, laugh more, eat dessert first, kiss my sleeping kids — all that jazz. 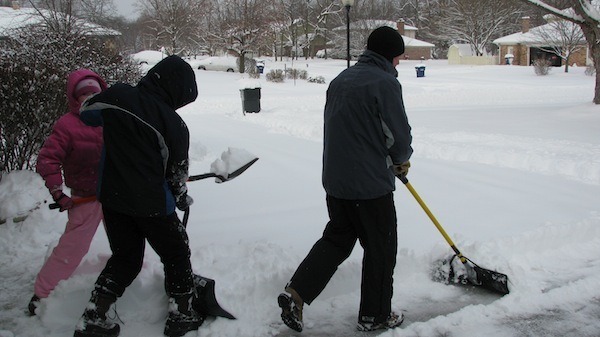 But: I miss shoveling snow! Indiana was blessed with a lovely snow storm last night. Balm to my soul. Anyone who knows me knows I didn’t leave Colorado in my rearview mirror seven years ago. It hangs around my neck like a tacky accessory I refuse to remove. It’s a virus I can’t shake. The West was my home for thirteen glorious years; it’s where I grew up, found Me, met grace, died a couple times, learned to live, work and play. It’s in my blood, and I’ll ache for it until I return for good. But in the meantime, a blanket of white provides temporary relief to the longing I feel for my home on the range. A snowy day doesn’t have to be an official snow day to be a Snow Day to me. This morning, though, it’s official. Work and school are closed. I’ve suited up my children to play in the snow and help Daddyo shovel. As I sit here in flannel jammies, my husband is outside laboring to clear twelve inches the heavens heaped on our driveway as we slept. I wish I could help him. Aside from feeling guilty that he’s pert near dead from cold and effort, I’m a little envious! I want to feel the warm, wet fleece against my neck and the cling of sweaty silks on my back. But if I do, I might die! So, I’ll watch through the triple panes from the big comfy couch as I sip coffee and type on my laptop with Ellen on in the background. And I’ll have hot cocoa ready for my cold, sweaty, rosy-cheeked loved ones. Beth, I really want to read a book from you. I so enjoy the way you write. I think I would really enjoy a novel. Can you give me one? Oh, Ann. You’re so encouraging, friend. Thank you! I’ll try to get right on that for ya! In honor of National Heart Month, and drawing inspiration from my new buddy Tombee Taker who just re-blogged his BlogFestivus post (http://shoutsfromtheabyss.wordpress.com/2014/02/09/blogfestivus-day-nine-and-to-all-a-good-night-2/), I’m throwing this one back out there into the blogosphere. You got to work in a lighthouse? And after only two weeks? My doctor still has me waiting. Oh, that’s right. I don’t have a doctor. I’m glad you recovered from your freak heart problem because meeting you has been darn nifty. I think I can safely describe it as a singular experience because I’m pretty sure there’s only one of you. I haven’t had a brush like yours but I’ve tried to be proactive and learn on my own that every moment is precious, which I assume is the reason you do things like eat dessert out of order and care about your kids. I try to appreciate every moment even though they are decidedly not created equal. For me the west is not an accessory. It’s my entire existence. I know nothing else. I’ve lived 99% of my life within 26 miles of Interstate 5. I’m my current digs it’s about one mile away. For the previous five years I could literally see I-5 traffic in the distance crawling the hills from my living room. I’m currently in Day 4 of not being able to leave the house during the Great Pacific NW Snowstorm Of 2014. The locals call it Snowpocalyse. We’ve already set a snowfall record for February for “recorded history.” The local news is breathlessly running 24/7 “team coverage” weather reports. I mean, they talked a lot about the weather before, but this snow thing has them all freaked out. I’d say it’s about six inches deep. Yawn. I’m happy to stay cooped up. The thought of shoveling snow never remotely crosses my mind.